Mobile app marketing specialist Fiksu has released its latest Index report and the results aren’t good for those on a tight budget. According to the index, app marketing costs continued to rise throughout the month of April - with noticeable volume pouring in from small to mid-sized publishers. As something of a counterpoint, the App Store Competitive Index - a metric which measures download volume among the top 200 ranked apps - dropped a full 25 percent, falling from March's peak of 7.1 million to 5.34 million. While the surge of big brand spending in Q1 2014 dropped off in April, the higher costs paid by smaller App Store contenders played a large role in April's Indexews. 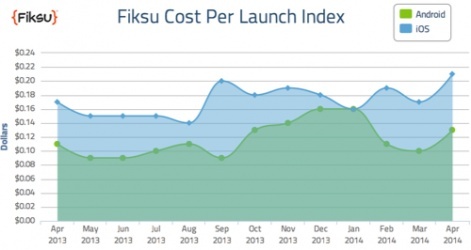 Fiksu's Cost per Loyal User Index, for example, rose five percent to $1.52 in April, while the Cost per Launch for Android jumped 30 percent to $0.13. Cost per Launch for iOS, meanwhile, increased 20 percent to $0.21. The CPI Index saw a significant increase on both major mobile platforms, with iOS increasing 28 percent to $1.24 while Android ticked up 28 percent to $1.31. Speaking on the April trends, Fiksu CEO Micah Adler viewed it as a transitional period. "April was an example of marketers with apps in the lower ranks getting visibility for their marketing spend as the big brands dialed back on spending before gearing up for their summer campaigns," Adler began. "Now is the time for mid-tier and smaller app publishers to capitalize on this lull in big brand spending and get more visibility for their marketing efforts." You can click here to read the full Fiksu Index for April.